The Ontario Regional Common Ground Alliance (ORCGA) developed a DPT Certification Program with the assistance of numerous subject matter experts, The Province of Ontario and Humber College. The Course provides instruction on the fundamentals of locating based on locating practices employed by specific industries. 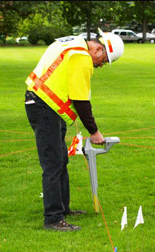 Two programs are available; the DPT 100 is for those new to the locating industry and the DPT 200 is an advanced, accelerated program, designed specifically for utility locators with a minimum of three years direct industry locating experience.